On October 19, the long awaited raising of the sustainable classroom, also known as the “Sun-Shack,” took place at Colby Sawyer College. 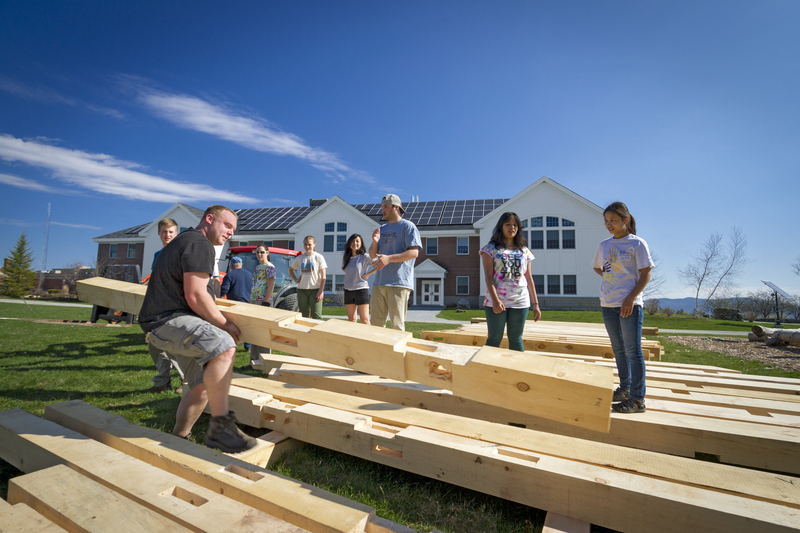 Students and community members enrolled in the sustainable design and construction class were involved in the raising of the Sun-shack. The enrolled members were also accompanied by fellow students and other community members during the event. The project began in the fall of 2012 and is taught by Bryan Felice, who is the founding owner of Undustrial Timber Frames. The class studied areas such as building sciences, engineering, permaculture, insulation, and design planning in order to turn this sustainable vision into reality. In the fall of 2012 the class focused on envisioning the final design of the classroom and began cutting of the frames in February. Most of the main timbers are Eastern White Pine, and the braces were a combination of both local yellow birch and black cherry. Every material that was obtained was within 35 miles of the College. This includes local loggers, cutters, and mills. This also included all the pegs of the Sun Shack, which were bought at North Cut Pegs in Walpole, NH. 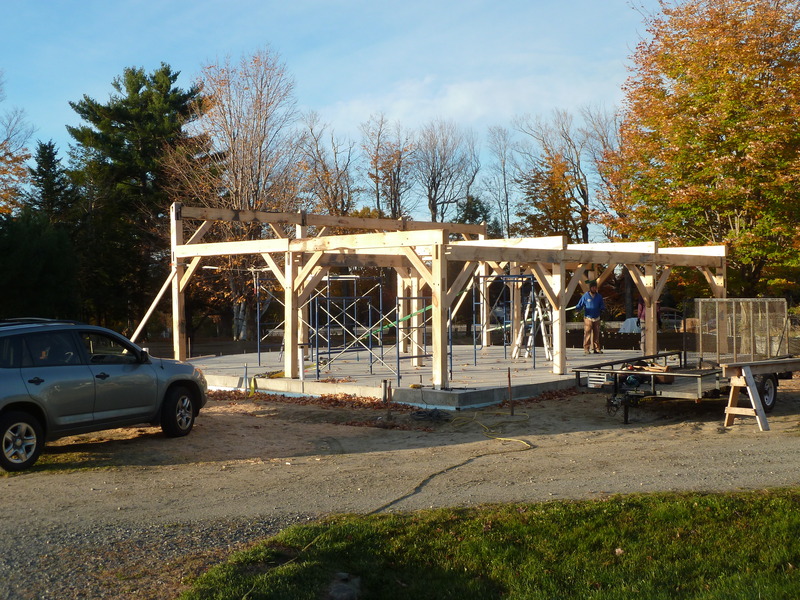 This small family business supplies 98% of all Timber frame pegs in the country. Unfortunately, permitting issues delayed the raising of the Sun-Shack and pushed back the event to this fall. There isn’t a specific due date for finishing the classroom, but the class is setting their sights on the end of the 2014 spring semester. Bryan Felice has worked in various capacities in the environmental field and has a passion for sustainable construction. When asked about whether or not he sees this project as a visual representation of what a transition town can look like, he enthusiastically responded with, “Oh absolutely”. Bryan explained the design of the Sun-Shack as being a traditional vernacular representation of New Hampshire, meaning that the design is based on the concept of 18th century houses in the region. He continued to describe the classroom as “designed to link the Old traditional vernacular with new 21st century technologies and techniques”. The Sun-Shack will be an educational facility beyond the present construction normality. The classroom is facing true south and will capture thermal energy for growing plants inside. Many houses and buildings today have been built facing different directly because of the technical advances in heating systems, this meant that they no longer had to be facing the sun to capture heat. The building will be monitored for moisture management, heat lost, and other recordings after completion. It will be a living laboratory of sustainable design. This project is not only an expectation of what is possible in a transition town, but it will also help the local community become empowered by its inspirational design and potential. The final product is meant to be a symbol of what is possible when a community comes together to make their vision of sustainability a reality. Below is a picture gallery which includes pictures of the class cutting the timbers last winter to the construction in spring and fall.